As some of you may have noticed, I am currently working my way through the second Humble ebook Bundle. I remember being vaguely interested in Little Brother when I first got the bundle, if only because it was dealing with a subject that I could discuss with my husband. If nothing, it would be nice to be able to actively engage with one of his special interests a bit more. 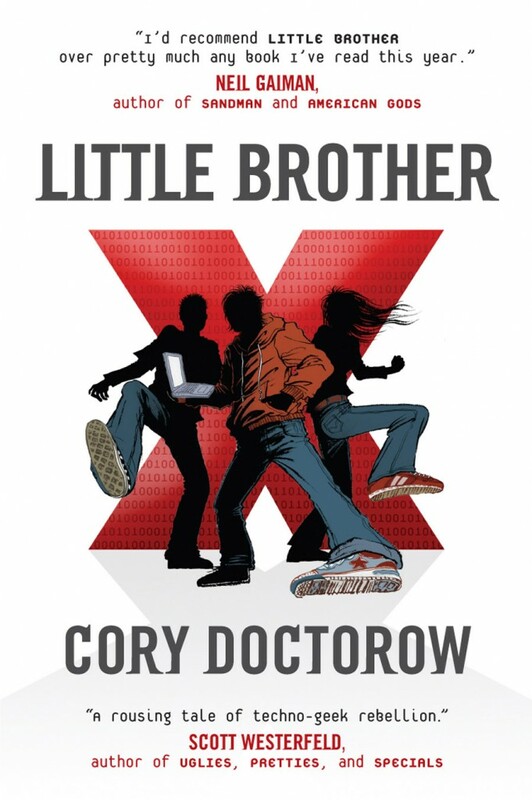 Little Brother follows Marcus Yallow, a more or less regular teen with a particular interest in technology and the ways that it can help him bunk off school. One particular day, he and some friends skip class, only to find themselves in the vicinity of a major terrorist attack on San Francisco. During the chaos, he and his friends are arrested by the Department of Home Security and interrogated for nearly a week. When he is let out, he realises that his best friend Darryl wasn't released with them. Combined with the fact that the DHS has made San Francisco into a police state, and Marcus has more than enough reason to take them down. Right, so there's something that I want to get out of the way right away. While I did enjoy Little Brother overall, there is a lot of stuff that Doctorow explains, especially at the beginning. While I do acknowledge that there's a fair bit that does need to be expanded on, especially if computers and security systems aren't subjects that you've looked into before, there is still a fine line with how much is necessary for proper engagement. I don't know whether this is because my husband has tried to explain at least some basic concepts to me, but I personally found that the stuff at the beginning kind of went overboard with the detail. Contrasting that, a concept that comes up later in the novel was so strangely explained that I had to get my husband to re-explain it for me when I got home from work. That last point aside though, there isn't really anything complicated enough to derail the plot and I can understand that you would want to err on the side of too much information when you're targeting a slightly younger audience. So this might be more of an annoyance if you're more familiar with coding when you go into this, but for complete beginners I can see the overabundance of detail being more useful than annoying. Having gotten that negativity out of the way, I will say that I really enjoyed Little Brother. It is a really insightful look into what could happen if a country decides that the needs of "security" overrides the rights of its citizens' to privacy and free speech. The fact that I finished this on the day that Erdogan banned Wikipedia in Turkey, in order to block out content by writers accused of "supporting terror", is not something that has escaped me. Following the initial terror attack at the beginning, terrorists aren't even considered a credible threat by the narrative, regardless of how much the DHS try to insist that they're the only threat. And I think that that is very telling actually. While terrorism is something that has mentally and emotionally shaped Western society since the turn of the century and I wouldn't want to underplay the damage that these individuals have caused to the families of their victims, I don't think that terrorists are what we are really scared of. At least for me, there is the awareness that terror groups just don't have the resources or numbers in order to actually change things or even react to the increased measures against them. In contrast, working as a public servant I am keenly aware of just how much information that a government has about its citizens, and the prospect of what could happen if my government decided that it could exploit that in the name of safety feels a lot more real and legitimately terrifies me at times. But then I talk to my parents about this, and they're of a generation that doesn't necessarily understand technology as much and would perhaps prefer to err on the side of security over internet freedom. Little Brother gets into this younger mindset really well, and is probably a good place to try and introduce these kinds of concepts to those who aren't as familiar with them.